Please join us for our annual Focus on Life benefit dinner/silent auction on Tuesday, April 16th. The revenue from this event will help us to promote the sanctity of life in 2019. We sell out so make your reservations early. Are you horrified at the actions of states like New York or concerned about a pro-abortion State of Michigan administration? This is your opportunity to do something about it and learn how we can respond. 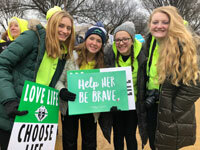 THANK YOU for helping our group attend the March for Life 2019! Enjoy some of our photos here. Please join the sidewalk prayer group in front of Planned Parenthood to the new time of Mondays at 1pm. According to the Centers for Disease Control (CDC), 43.6% of the women who had abortions in 2008, had obtained an abortion previously in their life. Close to 20% of women who aborted had at least 2 previous abortions. If you are in need of help with an existing pregnancy, there are numerous caring and compassionate local and national resources willing to give you the support you need. The following links are intended to help you begin your search for the information and resources. Please use them. To promote the well-being of the pre-born, infants, toddlers and their parents by teaching life changing skills and showing Christ’s love through material, emotional, and spiritual support. The Center for Women exists to offer hope and help to women experiencing a challenging or unplanned pregnancy. We desire to meet the emotional, spiritual, physical, medical and material needs of our clients. Through counseling, education, support and referral services, we seek to enable our clients to make choices that uphold their overall well being. For a list of Michigan pregnancy care centers, post abortive counselors and adoption service agencies alphabetized by city. Since 1970, the staff at the National Life Center has provided compassionate guidance and counseling to mothers facing pregnancy. We receive thousands of calls per month but no call is more important than the one YOU make. Every woman is treated with respect, dignity and kindess. Complete confidentially is guaranteed and our services are free. for the inmost girls. Crisis pregnancy testimonials and support. © 2019 Jackson Right To Life | All rights reserved.